What is Absynthe...? Maybe you do not exactly know what this green liquor is all about. First of all Absynthe or Absynth is a synonym for Absinthe, also known as the Green Fairy. It is an historical alcoholic drink, that was drunk for quite a while in Europe during the 19th century. Unfortunately it got banned at the beginning of the 20th century in almost all countries of the world (read more about the History of Absinthe at our info site). Therefore the notorious liquor "Absinthe" was illegal for a long period of time. But, and these are the good news, times have changed. Absynthe / Absinthe / Absent or Absint however you want to write it, is legal once again! This means you can buy a bottle of real Absinthe and experience what inspired people in the 19th century. In the USA the Green Fairy was legalized in 2008. In the European Union laws already changed in 1998. If you don't know how to drink Absynthe just check out our videos of how to drink Absinthe. We also have one video about the ritual here online at this site. It features the French style of preparing a glass of the Green Fairy. If you perform the drinking ritual, you will experience that the green liquor turns white as soon as you add water. This effect is called the "louche". The green elixir louches to an oplaescent white. It is a very magical moment. It is said that this is the moment, when the Green Fairy evokes to life! As you see in the video you need an Absinthe glass to drink Absinthe. It has a special shape: In the stem you have a reservoir which doses the correct amount of Absynthe. Probably the most important tool you need to drink Absinthe is the Absinthe spoon. You place the spoon on the glass, put one or two sugar cubes on it and then you pour Absinthe and water over it. The sugar dissolves and drips into the green liquor in the bottom of the glass. The best sugar cubes are the individually wrapped Absinthe sugar cubes we sell in our stoire. They are less pressed and smaller in size compared to regular sugar cubes. Therefore they dissolve easier. We also recommend to drink an original Absinthe. This means an Absynthe, that is made according to old recipes and one that contains wormwood but no artificial addings (colorings etc.). At our Absinthe bestseller list you can find these Absinthes. For the Absinthe ritual you also need to buy an Absinthe spoon. Good spoons are made of stainless steel and are authentic reproductions of antique originals. The latter is important, because drinking a glass of the Green Fairy also means, that you travel back in time. This authentic feeling of nostalgia is best evoked with authentic Absinthe accessories. At our online store we sell a wide range of beautiful accessories. We can especially recommend the Feuilles Absynthe spoon. It is beautifully decorated with wormwood leaves. A very functional spoon with a cheap price, is the Absinthe spoon Classic. This is a good starter spoon, its design is as well an accurate reproduction of the vintage original. Where can I buy real Absynthe? ALANDIA ships worldwide, including the USA (if you want to know more about buying Absinthe in the USA, visit our info site). The Absinthe delivery is 100% guaranteed, which means if anything happens and you should not get your order, ALANDIA will refund you your money. But do not worry, the insurance almost never has to be used. In the online shop you find quality Absynthe and as well accessories like spoons, glasses, fountains and sugar at fair prices. We started with our business in 2001, right after Absinthe was legalized in the European Union. Meanwhile we are serving the international Absinthe community with athe green liquor but as well all the accessories, that are needed to experience the world of Absinthe. ALANDIA has as well its own range of Absinthes, marketed under the name ALANDIA Spirits. 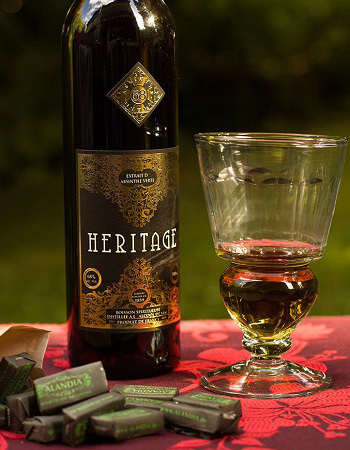 Our portfolio includes brands like Heritage Verte, this is the brand you can also see on the photo on this page, Maison ALANDIA, which is our house brand, Suisse Verte, La Bleue, Epoque, Moulin Vert, République and our bestselling strong Absinthe Strong68. All of the aforemetioned Absinthes are for sale in our store.